John Griffith-Jones became Chairman of the Financial Conduct Authority (FCA) in 2013. The FCA was set up to regulate the UK financial sector. John said that 'the tone at the till' is what matters to consumers. John Griffith-Jones spoke about the Financial Conduct Authority's (FCA) work to regulate the UK financial sector, at a recent ICAS event. Regulators can help ensure that markets work better in financial services, but the onus to bring about positive change lies with the regulated companies themselves. That was one of the key messages from John Griffith-Jones, Chairman of the FCA, at a recent ICAS Business Insights event in Edinburgh. John likened the process of regulation to a football match, explaining: "The regulator is the referee, the companies are the players. A bad referee can ruin a game, but even a good referee can't make the passes go straight. Change will have to come from the industry itself." John Griffith-Jones became chairman of the FCA in April 2013, and chairman of its subsidiary, the Payments System Regulator, in April 2014. He was formerly UK chairman and senior partner with KPMG. He stressed the importance of the "utility" aspects of the financial sector – like the payments system and the insurance sector's role in helping people to manage risk and said these tended to be taken for granted because they work well. John also said that the global financial crisis had damaged trust in the whole sector, and a series of emerging conduct issues over the past few years has added to that problem. He added, however: "The vast majority of people in financial services operate at a high level of integrity, but trust has to be earned, and the banks and others are working hard to fix this." According to John, a lot had been done to change corporate culture and "tone at the top", but as well as changing their thinking, organisations have to focus on what they do and how they treat customers. As he put it: "The 'tone at the till' is what matters to consumers." He added: "It's too early to say yet whether the changes have been effective. We need patience from everybody – without any complacency – because we need to give this time to work." He said: "We need to be careful that... innovation is in the interest of the consumer, but innovation will not happen at a speed to suit the regulator. We have to engage early and engage often." In a Q&A session with ICAS members, John Griffith-Jones addressed a range of issues including cyber-crime, the impact of high-frequency trading on market stability, regulation in and out of the European Union and the call, in the ICAS manifesto, for greater protection for users of accountancy services by ensuring that "accountants" are qualified and regulated. He gave guarded support to the latter, saying: "My personal view is that there is a perceived need for some kind of regulated service for certain services. But I would not say that everyone who 'does the numbers' for people should have to be regulated." 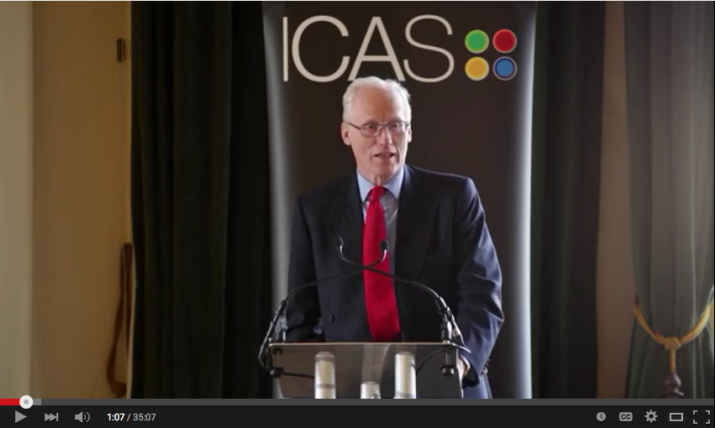 John-Griffith Jones outlines the regulator's role on financial misconduct at a recent ICAS Business Insights event. A range of help sheets for Practice, Audit and Technical support as well as guidance for International Education Standard 8.